Visitors are encouraged to take a guided tour of the U.S. Capitol via the new Capitol Visitor Center. Also, additional information can be obtained for individuals, families, and small groups visiting the offices of their Senators and Representatives. Offices of Representatives are located in the three buildings on the south side of the Capitol along Independence Avenue: the Cannon, Longworth, and Rayburn Buildings. 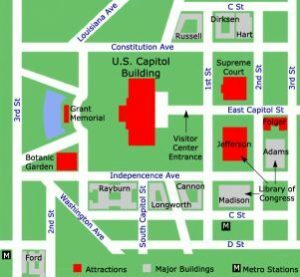 Senators have offices in the three buildings on the north side of the Capitol along Constitution Avenue: the Russell, Dirksen, and Hart Buildings. Search to find your Representative or Senator.